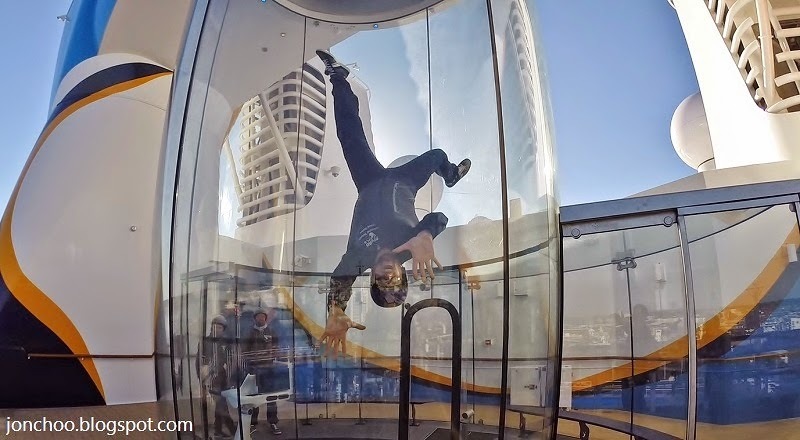 RipCord by iFLY is the first, according to Royal Caribbean, skydiving experience on cruise ship. Located on the stern of a Quantum-class ship, above the FlowRider surf simulator, guests can finally learn how to fly in the safety of a skydiving simulator. Last weekend we were given the opportunity to participate in a teaser course on board the Anthem of the Seas. Unfortunately, yours was unable to participate because he has had one too many cocktails. However according to other guests, they are first outfitted in a skydiving gear (minus the parachute obviously), jumpsuit and all before being a 30 second go on the 7 meter tall wind tunnel. On a typical cruise, each guests will be allowed two, one minute flights with an instructor. Embedded is a video of a truly awesome (and terrifying to me) of a flight instructor showing off his mad skydiving skills.